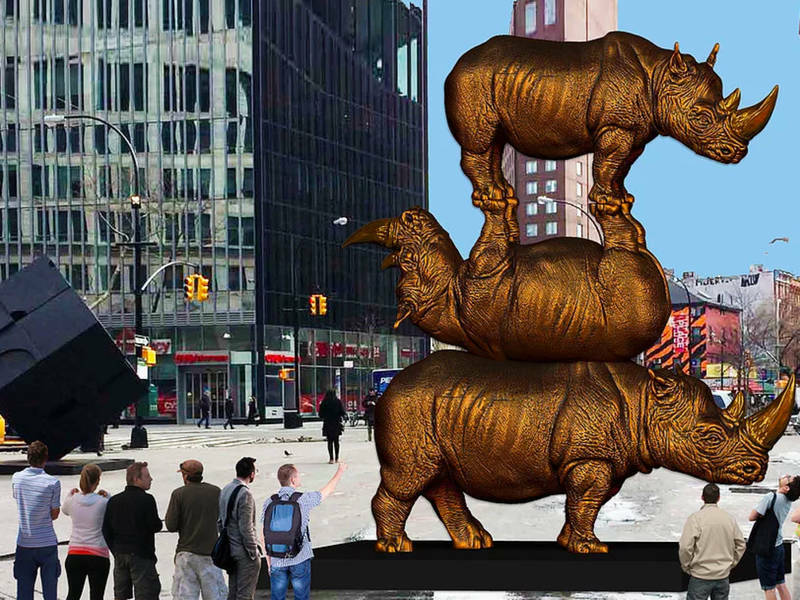 EAST VILLAGE, NY — The world’s biggest rhino statue will be installed in Astor Place next year. The massive sculpture from the Australian artists Gillie and Marc Shatner will be installed in March 2018. The couple have been planning the sculpture, which they say will be the largest rhino sculpture ever created, for months. It will stand 16 feet tall once completed. The project, titled “The Last Three,” will show three rhinos stacked on top of each other to represent the last three Northern White Rhinos alive on the planet. The Shatners, known worldwide for their work by their first names say they hope the statue will raise awareness about the plight of the Northern White Rhino and encourage support for rhino conservation. The project is sponsored by National Geographic’s Nat Geo Wild and other groups. When it debuts in March, organizers will also launch an augmented reality app that will allow users to learn about the world’s last three living rhinos. The trio, one male and two female, all live under armed guard in a conservancy in Kenya. Their population has dwindled drastically as hundreds of have been poached for their valuable horns.